However, the entry of mega movie stars into the state's politics in the future may depend on the results scored by Kamal Haasan's party Makkal Needhi Maiam (MNM), is one view. There is also another view that after the entry of southern superstar Rajinikanth, there may not be any continuous flow of mass heroes into Tamil Nadu's politics as the political dynamics have changed. "Gone are the days when a movie actor had a distinctive edge over others in the political arena. Today, the electoral content has changed and the actors have to fight along with other politicians for votes," Jhon Arokiasamy, a political strategist, told IANS. "But movie actors are here to stay in politics and will be a force to reckon with. 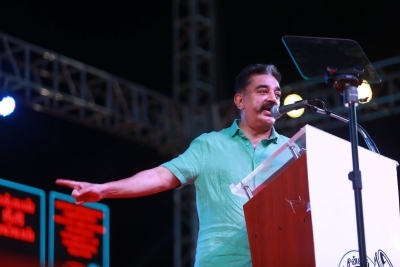 If Kamal Haasan's MNM secures about a 3-5 per cent vote share in the Lok Sabha elections, then one can safely say that mega heroes continue to have a space in Tamil Nadu's political world," Arokiasamy added. Five of the state's former Chief Ministers - C.N. Annadurai, M. Karunanidhi, M.G. Ramachandran (MGR), Janaki Ramachandran and J. Jayalalitha - had their roots in the film industry. In 2005, Vijaykant, 63, an action hero known to perform stunts in movies without a double, floated his DMDK party as an alternative to the two dominant Dravidian parties -- the AIADMK and the DMK. However, over the years the DMDK's vote share has come down. "Mega heroes enter politics at the fag end of their movie career. With the political landscape changing one has to see whether the next set of heroes would take the plunge," writer and political commentator Maalan Narayanan told IANS. "Rajinikanth will surely take the state by storm when he takes the final plunge," political analyst Raveendhran Dhuraiswamy told IANS. To the question whether the field is conducive for actors like Vijay to enter, Dhuraiswamy said: "The flow of actors into Tamil Nadu politics will continue. Vijay can enter and there may be some moneyed corporates who can underwrite his political expenditure." "This may fetch him some additional votes," Dhuraiswamy added. Polls to Tamil Nadu's 39 Lok Sabha seats and the by-elections for 18 Assembly seats, are scheduled for April 18.